Heal your body, mind, and spirit with these quick and easy yoga and meditation practices. The Yoga Healer will put the power to heal and revitalize into your own hands—mind, body, and spirit! 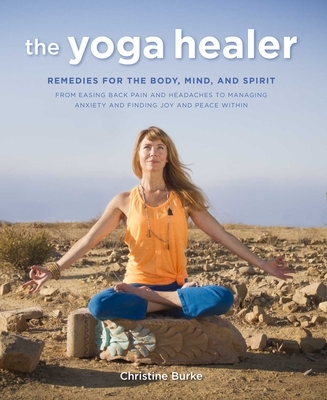 Practitioners of all levels from beginner to advanced, occasional to frequent, will love this accessible handbook of remedies based on the art and science of yoga. The first three chapters—Remedies for the Body, Remedies for the Mind, and Remedies for the Spirit—cover a number of physical, mental, and emotional concerns and provide three simple, concise practices for each one to address the condition. The final chapter includes longer combined sequences for morning, noon, and night to wake up, recharge, and relax. All poses and sequences are illustrated with stylish, clear photography. Each yoga remedy is designed to last 15 minutes or less—perfect for people with busy lives—and targets a specific condition. From alleviating daily aches and pains to improving your state of mind and tapping into your creative spirit, here you will find succinct, powerful tools that can be practiced anywhere, anytime. Christine Burke stepped into yoga as an actress and a dancer in New York in 1994. In 2000 she received her first certification in Los Angeles as a 200-hour level teacher. She has been teaching full time ever since. She is a Registered Yoga Teacher with Yoga Alliance at the 500-hour + level and has taught thousands of students of all ages. Christine and her husband Gary McCleery opened Liberation Yoga in 2004. The studio has been named in the “Top 20 Yoga Studios In The World” by Travel + Leisure magazine and “Best Yoga Studio In LA” by LA Weekly and online city guide Citysearch on several occasions. Christine’s writing has been featured in LA Yoga and Yogi Times and her teaching has been featured in LA Times, LA Weekly, Yogi Times, LA Yoga, Westways, Great Yoga Teachers, and many online magazines. She lives happily sharing the gift of yoga in Los Angeles with her husband, daughter Clementine, and dog Mattie.